At Hartland Abbey we really want to ensure that everyone in the family enjoys their day out, whatever their age. 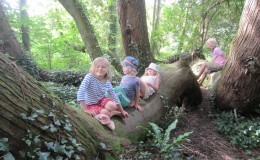 We have specifically refrained from offering modern hype – children who visit the Abbey will find old fashioned fun. Whilst parents are looking around the house, children can be kept amused by doing the informative Quiz. Educational and fun, it explores many aspects of the house and its history over the centuries. Every entrant receives a prize! For discovering the outdoors we have a Nature Trail leaflet for children to follow and colour in, with puzzles and fun. Outdoors there is plenty of space for children to run about, play hide and seek and explore the many paths around the gardens and walks to the beach. 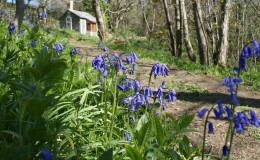 Climb up the zig zag paths and discover the woodland summerhouse and the gazebo on the way through the woods to the coast at Blackpool Mill and look out across the Atlantic Ocean towards Lundy Island and, ultimately, America! There is a good chance of seeing one of our most spectacular birds, the buzzard, on the way and peregrine falcons hunting the cliffs. In the woods Roe deer, foxes, badgers and many birds are possible to see if you are lucky (and quiet!) and oyster catchers, cormorants and seagulls at the beach. It’s a great place to learn about our native wildflowers in spring too and in good summers the butterflies at Hartland are wonderful. Children can explore the small winding paths in the woodland gardens which lead to the Vegetable Garden where fruit and vegetables for the house and tea room are grown. Nearly all the salad vegetables go straight to the kitchen to be served the same day. All the vegetables are organically grown with the only exception being slug killer, otherwise we would not be able to produce anything to eat! The slugs overwinter in the garden and the snails come out of the walls at night, both consume anything in their path! We have tried egg shells and beer as natural control but there are just too many hungry slugs! The donkeys Becky and Snowdrop, peacocks, guinea fowl, Black Welsh Mountain sheep and the bantams all fascinate children. 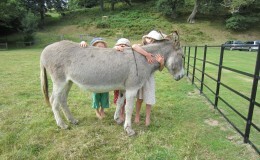 Please be aware that although the donkeys are very friendly they are capable of kicking and biting! There is so much to do and see, so much space to run about and feel free.